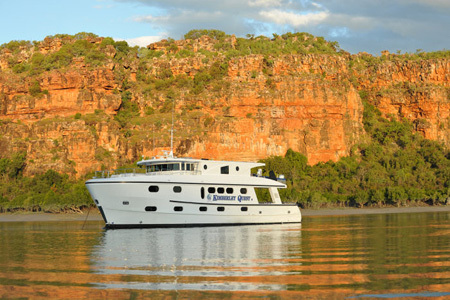 The west of Australia has some fantastic fishing locations on offer, but since there are so many available we have tried to focus on the 2 main options that are sought after by keen anglers worldwide… The Kimberley and The Rowley Shoals. Both of these regions are only accessible by live aboard vessel and your accommodation on board is five star with all the comforts of home plus the added bonus of being able to fish around the clock if you choose to! The Rowley Shoals is one of the greatest places in Australia to chase Sailfish, Marlin, Yellowfin Tuna, Dogtooth Tuna, Wahoo and Trevally by day and you have the option to do some heavy tackle fishing for Broadbill Swordfish at night. All charters depart from Broome and head 168 nautical miles offshore to fish the edge of the Continental Shelf, a fishing paradise that you will never forget! Offering some of the best fishing in the world, spectacular scenery & perfect weather the Kimberley is undoubtedly a very special place. Isolated and remote, this true wilderness country encompasses rugged gorges, towering sandstone escarpments, meandering river systems and immense estuaries. The waters are teeming with many species of fish including Barramundi, Mangrove Jack, Fingermark Bream, Salmon, Giant Trevally and more.